1. Sinks and vanities - Clutter causes chaos that can add to daily stress. To establish a peaceful retreat without the disorder that commonly overtakes bathrooms, it’s important to keep organization in mind when selecting a sink and vanity combination. The key is to find a balance between style and functionality. Consider the DXV Modulus collection, which creates simple yet dramatic spaces with a selection of trending materials and finishes for optimum style. 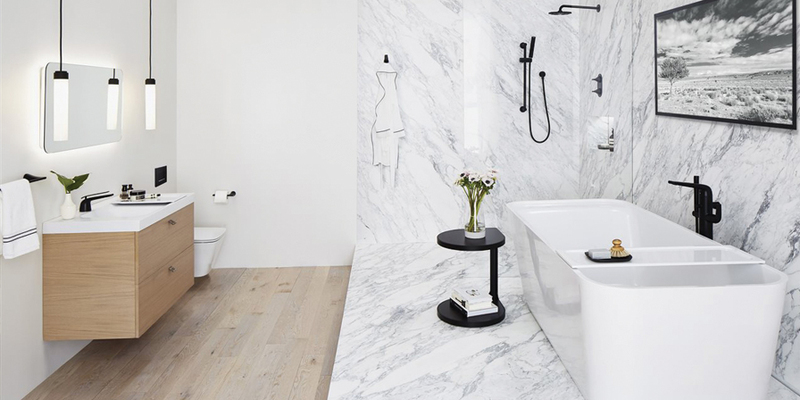 It brings high design to any project, including master bathrooms and powder rooms, where space may be at a premium. that elevates any bathroom setting. 3. Shower systems - Forget boring single showerheads. Today’s complete shower systems go beyond the basic clean to provide a comprehensive bathing experience. Design the space to fit your preferences with different sprays and various angles for massage, invigoration or total relaxation. You can adjust the flow and temperature to your liking. It’s customization on demand. To further enhance the shower experience, add in spa-like elements, like your choice of adjustable lighting and music to match your mood. Go ahead and close your eyes, feel the water, and escape while getting lost in your favorite tunes. With the right elements and well-thought-out design, you can craft your own personal oasis. Adding to your home’s value while relishing in its pleasure - now that’s a dream come true.